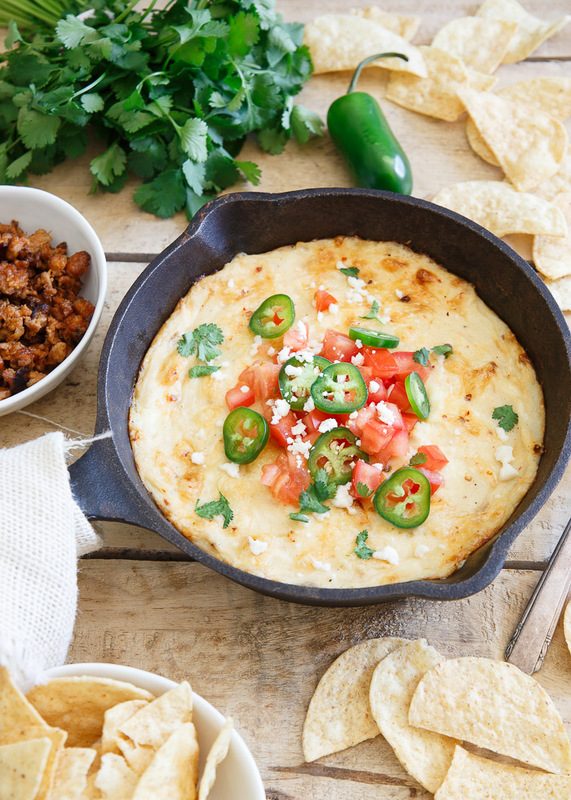 A lightened-up queso fundido with only 1/3 the cheese! All the creamy cheesiness you love of the classic Mexican dish, made healthier with a hidden veggie boost. 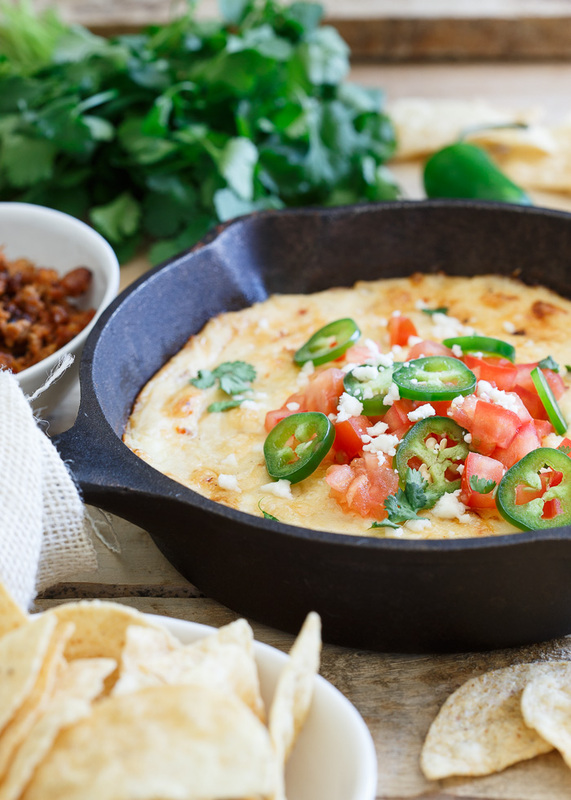 Today, in honor of Cinco de Mayo, Gina from Running to the Kitchen brings us a healthier spin on queso fundido – and I’m SO excited to share it! 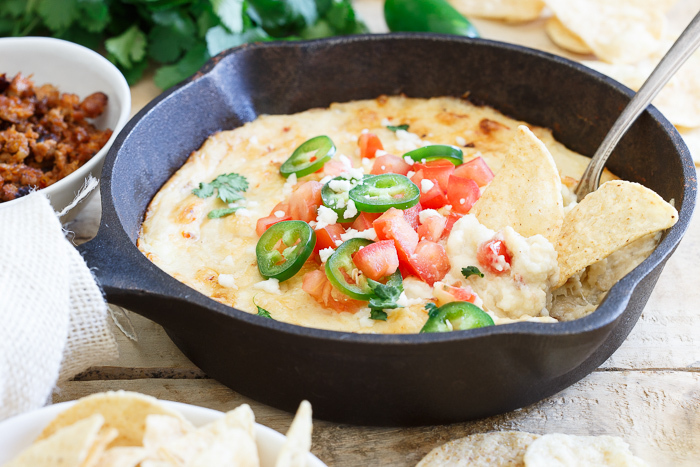 Cauliflower – cooked and pureed until rich and creamy – forms the surprisingly rich base to this still-cheesy and decadent-tasting queso fundido. Perfect for party noshing without the heavy feeling after. I used to hate on cauliflower. As a long time broccoli lover, it always just seemed like its not as tasty white cousin to me who happened to also cost like twice as much. So I never bought it. Then all these cauliflower crazes started appearing. First it was pizza crust (um, what?!) then cauli-bites all sauced up with buffalo sauce became a thing, next thing you know people are mashing it up and calling it faux mashed potatoes. I really thought the world had gone mad. Then, a few years ago, I did a Whole30 and I finally caved to the mashed cauliflower thing. And guess what? I didn’t hate it. In fact, mixed with some creamy coconut milk, garlic and herbs, it was pretty darn delicious (funny what your brain deems delicious when you’re off sugar for a month). Slowly but surely, after that, cauliflower started making some guest appearances in my diet. If we were dating, I’d call this the I’ve yet to introduce him to my family, but I kinda really like the guy stage. Now I’m at the point where it’s sneaking its way into all sorts of meals, most recently, this Lightened-Up Queso Fundido. If you’ve ever had the real dish at a Mexican restaurant, you know queso fundido is decadent beyond words. Hot, gooey cheese upon cheese upon more cheese and it’s of course, insanely delicious. It’s also a clogged artery waiting to happen. 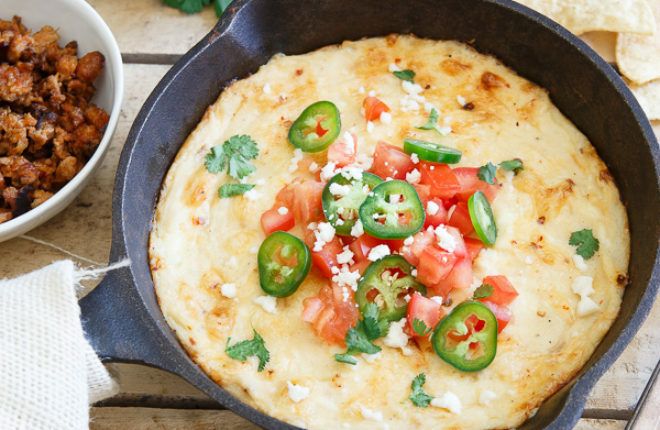 With cauliflower as the base and about one third of the cheese you’d normally use, this lightened up queso fundido transforms into a dish you can feel a little bit better about eating. 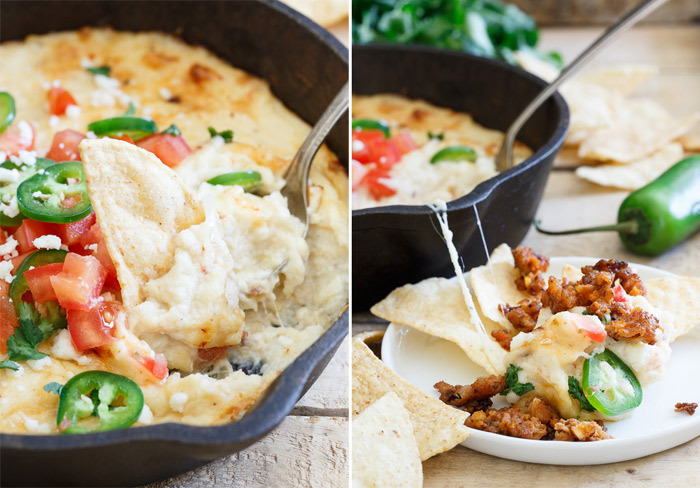 Good news is it’s not like your cheese dip went and got all vegetable-y on you either. The cauliflower flavor kind of just blends into the background so you definitely still get that gooey cheese factor that’s pretty much the backbone of a good queso fundido. Plus, with an optional chorizo topping, it’s easy to customize for meat-eaters and vegetarians eating together. Just top the carnivores’ portions with a bit of spicy chorizo and they’re good to go. Cauliflower, I apologize. All those wasted years, it was me, not you. Place cauliflower florets in a large skillet or pot with a cover. Fill with water until the entire bottom of the pan is covered. Bring to a boil. Cover and cook until fork tender, 5-7 minutes. 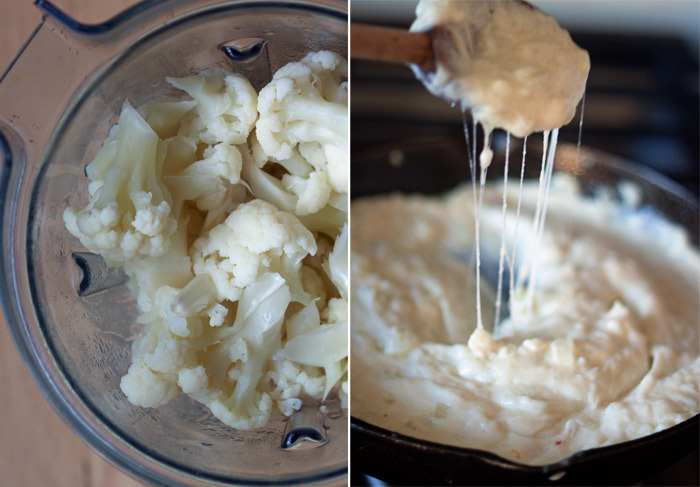 Drain water and transfer cauliflower to a food processor fitted with the s-blade or a high-powered blender. Add garlic, milk, salt, and pepper to the food processor or blender along with the cauliflower. Process until completely smooth, scraping down the sides as needed. Add a little more milk if necessary to get things moving. Set aside. Place butter in a 10-inch cast iron skillet over medium heat. Add onions and cook until softened, 2-3 minutes. Add the cauliflower mixture to the skillet and reduce heat to low. Add cheeses to the skillet and mix until well combined. Transfer the skillet to the oven and bake for about 15 minutes until top starts to turn golden brown and bubbly. You may want to finish it off with 1-2 minutes under the broiler for extra golden brown goodness. Remove from oven and finish with your favorite toppings. Serve warm with tortilla chips. Top carnivores’ portions with cooked, crumbled chorizo. It really is! I tested it before posting (it’s Gina’s recipe) and even though I’m not supposed to eat dairy I snuck a bite. It was hard to stop at one and my husband gobbled a bunch of it up! What happens if I use whole wheat flour instead of all purpose? I know it will affect the taste but does it affect the texture, particularly the fluffiness? And do I substitute the same amount if I choose to try that? Whoops! Yes I was asking about the fluffy pumpkin pancakes. 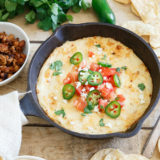 I was excited about this queso fundido and I plan to try it next! I made those pumpkin pancakes for dinner tonight (splurge food night)! They were delicious!